From brand The Humble Co.
Made with a biodegradable bamboo stick and BPA-free cotton swab. A great alternative to plastic cotton ear buds. Denttabs have cleverly removed all unnecessary water from conventional toothpaste which not only means we can buy it plastic free but also removes the need for a lot of chemicals and preservatives. Simply chew tablet with teeth then brush with wet toothbrush as normal and rinse. A great alternative to plastic packaged toothpaste. Contains the key essential minerals our teeth need to thrive, such as calcium, potassium and magnesium. Blended with spearmint leaf essential oil which is a strong antiseptic, eliminating germs and promotes healing. It has a delicate minty taste and is non-foaming to promote re-mineralisation. Fluoride and SLS free. Comes in a recyclable glass jar with aluminium lid. Made from sustainable bamboo fibre together with charcoal, candelilla wax and peppermint essential oil. Packed in a fully compostable kraft box, with a reusable glass dispenser which is designed to be used again and again with their floss refills, available in a 2 pack at £7. A great alternative to nylon or PTFE plastic floss options. Bamboo toothbrush, two sizes kids and adults. Soft bristles. Bristles are made from nylon 4 - a biodegradable nylon. When your toothbrush comes to the end of its life, either upcycle and use for cleaning around the house or break off the head before composting the the handle. You can return the heads to Georganics - collect 10 heads and pop into envelop addressed to FREE-POST GEORGANICS and drop at post office. Georganics will then make sure they are disposed of properly and don’t end up in landfill. A great alternative to plastic toothbrushes. Hand made in the UK. Vegan friendly, paraben, palm oil and cruelty free, this bar is packed full of essential oils and goodies for your skin. Orange and Lavender essential oils give this shaving soap a bold character. Clay extracts help to create a silky smooth shave, and soothing aloe vera clams the skin. Traditional safety razor with 5 blades. Quality design and make, you do not need to apply pressure when shaving, just hold the handle in your finger tips, and let the weight of the razor head glide over your skin, giving you the closest shave and the smoothest skin. Superior platinum double edge blades fit snugly in your razor. Avoid plastic disposable razor options and invest in a razor that won’t end up in the bin. All natural, aluminium free and plastic free. Made from a mix of organic coconut oil, mango butter and essential oils along with baking soda to deodorise and arrowroot to absorb moisture. All ingredients are ethically sourced, cruelty free and suitable for vegans. Comes in compostable cardboard packaging. A 70g tube should last you 2 months. From brand LoofCo. Made from Loofah plant. This body loofah will gently expand and soften in water, use it in the shower or bath and it will gently clean, exfoliate, smooth and refreshes your skin. 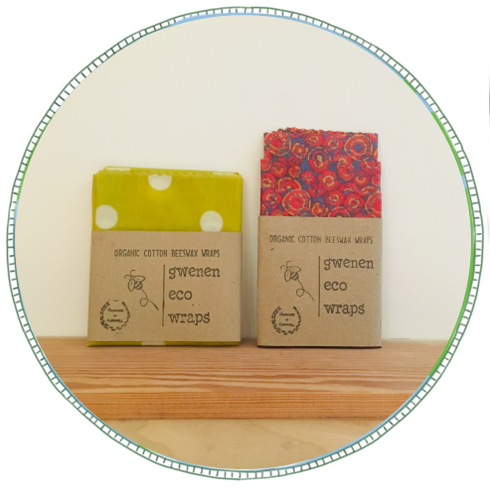 Biodegradable & compostable alternative to plastic exfoliators and sponges. To keep loofah fresh between uses, rinse and squeeze out excess water and hang to dry from the cotton string loop. Occasionally wash in the washing machine or by hand if you like. 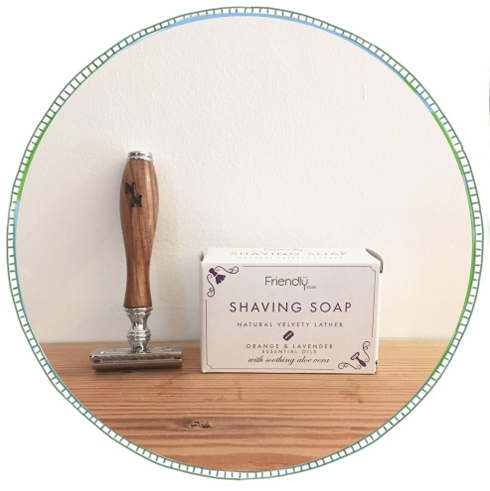 Hand made in Cornwall from natural ingredients with no nasties and completely plastic free. This Coconut and Lime Solid Shampoo bar rehydrates dull or dry hair and adds health and shine. Ideal for frequent use. It helps nourish and restore lustre for a sparkling clean result. Hand made in UK from a mix of olive, coconut and shea oils that produce a rich creamy lather thats naturally moisturising. Available in a range of fragrances all from delicious natural essential oils. Free from Parabens, SLS and Palm Oil. Completely plastic free, packaged in cardboard packaging. Made from 100% organic and sustainably sourced bamboo that will happily return to nature at the end of its useful life. Each utensil is made from a single piece of organically grown bamboo which is then hand shaped and finished. Set consists of oval spoon, round spoon, slotted spoon and spatula. Bamboo is more durable than wood, is heat & stain resistant and is ideal for non-stick cookware. Can be washed in the dishwasher however, as with wooden products, we recommend hand washing to prolong life. Avoid soaking. Not recommended for microwave. A handy alternative to plastic options if you’re looking for a plastic-free kitchen! Hand made in Cornwall. Using 100% natural, non-toxic materials. Made using GOTS certified organic cotton together with a mix of natural beeswax from Cornwall, unfiltered pine resin and organic jojoba oil. These wraps are compostable and biodegradable. A great alternative to single-use plastic wrap. Use for anything that you would ordinarily use cling film for. The warmth of your hands gently moulds the wraps creating a seal that helps keep food fresh. Great for use in the kitchen and also for when you are out and about. Wash gently in cool water and let dry. Each wrap should last around a year depending on use and care. Not to be used on raw meat or fish. 3 pack includes a small, medium and large wrap. 1 pack is a single large sheet 45cm x 55cm. We also have a vegan version of the 3 pack using soya and candililla wax. A reusable cutlery set from Bambu. A handy alternative to disposable options while eating on the go. A reusable straw made from stainless steel. 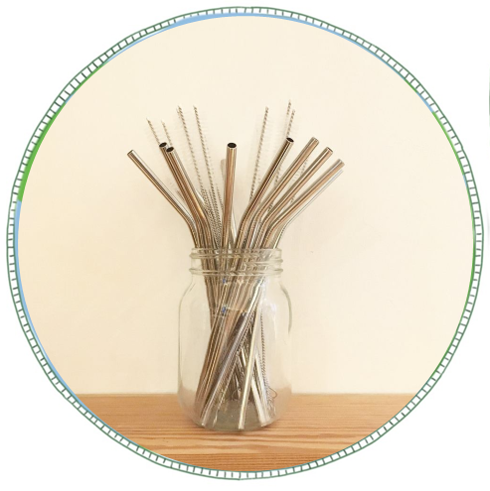 Remove the need for single-use straws either at home or on the go. A handy straw cleaner useful if straw is used with fruit juices or smoothies. Made from stainless steel and keeps food warm for 5 hours and cold for 7 hours. Leakproof guaranteed this jar doesn't alter flavour and taste. Remove the need for fast food that comes in packaging and opt for a packed lunch instead! From brand Qwetch. Made from 18/8 Stainless Steel. Isothermal double wall bottle, keeping drinks cool for 24hrs or hot for 12hrs. 500ml size, great for when you are out and about. Remove the need for plastic water bottles and refill. We selected rCUP because not only are their cups fit for use, they are also a great Cornish company. Each rCUP is made from 6 used disposable coffee cups, is insulated so will keep your drink warm or cool and is 100% leak proof with an easy to open and close lid. Its also fully recyclable at the end of its life. rCUP also have a great warranty where they offer to replace worn or damaged lid seals for free. They guarantee rCUP for one year subject to fair wear and tear. So not only does buying an rCUP mean that used coffee cups are put to good use they’ll also ensure less disposable cups are used in the future. Our bags are from Jutexpo. Founded in 2002, they are a small, family run business based in the Midlands. We also love Jute. Jute is fully sustainable. It is a strong, natural, affordable fibre with a low carbon and water footprint. Nothing is genetically modified where Jute is concerned, no pesticides or fertilisers are used to enhance the growing process. It is 100% bio-degradable. 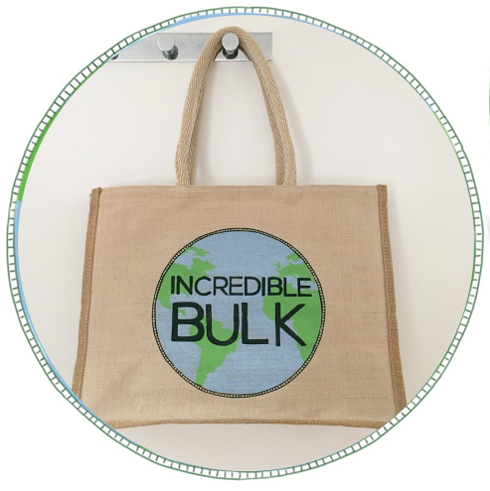 Our jute bags are lined with PP, this lining adds to the strength and lifespan of the bag, at the end of its life the plastic lining can be peeled off to be recycled and the jute fabric can be fully composted. Alternatively the bag can be taken to a fabric recycling centre, after the clothing is sorted the bags go to be shredded and the fibres are recycled and used as wadding. The bags lifespan is 4+ years, with an equally long secondary lifespan as storage in garages/cars etc, additionally we’re told they are often used as planters for growing fruits and veg! From brand Suma. Fragrance free so it's kind and gentle to all hair types. (If you like a fragrance we like to add our favourite essential oil). Exceptionally mild shampoo, suitable for frequent use. All Suma bodycare products carry Leaping Bunny and Vegan Society certification so you can be confident they are animal cruelty-free. The range is made in the UK and completely free of parabens, artificial colours and fragrances. Bring any container to refill, if you would like to test bring small container and ask for a tester sample amount. Measured by weight so refill bottle doesn't need to be completely empty before refill. (100g roughly equals 100ml). Ingredients: Aqua (water), sodium lauryl ether sulphate (from coconut oil), cocodiethanolamide (from coconut oil) ,citric acid (from maize), sodium chloride (sea salt). No nasties: Bio D do not use: Phosphates, E.D.T.A. (Ethylenediaminetetraacetic Acid), Enzymes, Optical Brighteners, Chlorine Bleaches, Petroleum-derived Additives, Chemical Plasticisers, Formaldehyde, Animal derived Glycerin or Glycerine, Lanolin, Sodium Tallowate, Synthetic Dyes, Synthetic Perfumes or Titanium Dioxide.